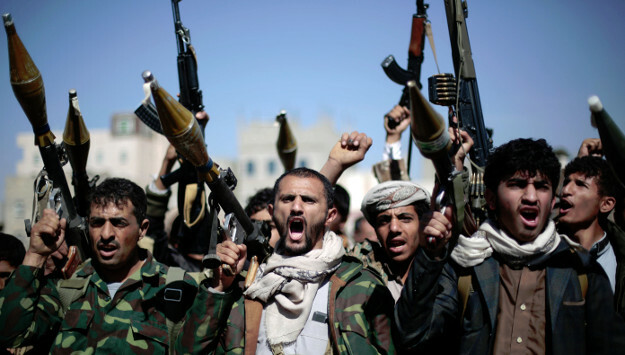 A series of clashes between Yemeni Houthi militias and the Saudi-led coalition have escalated over the past week, further fueling tension between Saudi Arabia and Iran, which allegedly provides financial assistance and weapons to the Yemeni rebels. Last Friday, the Saudi Royal Air Force said it had intercepted an Iranian ballistic missile headed towards the populated city of Jizan, southwest of the Kingdom, that had been fired by Houthi insurgents. According to the official spokesman for the coalition, Colonel Turki al-Maliki, “this aggression on part of the Houthi insurgents proves the continued involvement of the Iranian regime in threatening the security of the Kingdom and the region.” He added that Houthi rebels have launched 195 Iranian-made ballistic missiles into Saudi Arabia, killing 112 civilians and wounding hundreds since the beginning of the Yemeni war three years ago. Separately, the coalition, in conjunction with the Yemeni national army, has reportedly advanced into both Houthi-held port city of Hodeidah and Western Dar’a after heavy artillery shelling on Houthi-controlled areas. According to reports from the Yemeni Ministry of Defense, the clashes led to the death of a number of Houthi leaders, including Ahmad Ala’-Allah Al-Ria’i and Ahmad Al-Ghazi, who were killed in the Haidan District in Sa’da Governorate, alongside over 50 of their associates. Aided by Yemeni Army forces, the coalition was able to seize a communications room that had served as an operation coordination center amongst frontline insurgents. On Friday, Yemeni Minister of Information, Muhammad al-Irani, confirmed that Houthi militias have raided UNICEF and WFP warehouse storages in Hodeidah in response to the killing of some of their forces. The incident also coincides with UN envoy to Yemen Martin Griffiths’ meeting with representatives of the Houthis in the Omani capital of Muscat to encourage them to participate in the Geneva peace talks. The UN-led talks scheduled for earlier this month collapsed after the Houthis failed to show up for the meeting. Griffiths’ latest visit to San’aa, however, suggests that he intends to continue the peace efforts. The head of the Houthi delegation, Mohammed Abdulsalam, iterated a number of demands that needed to be addressed before they cooperate in the peace talks. Some of the issues discussed included the opening of San’aa airport, release of prisoners, and economic conditions induced by the siege of Hodeidah. Comment: Despite the coalition’s latest battlefield gains, Saudi concerns over Iran’s support for the Yemeni rebels have not abated. Riyadh and its regional allies say the most important step towards ending the Yemen crisis is to end Iran’s supply of arms to the Houthis. Iran’s transfer of ballistic missiles and drones to the Houthis – which according to a recent United Nations report has continued despite the 2015 arms embargo set in place by the UN Resolution 2216 – is believed to have prolonged the war and undercut any potential for a political settlement to end the conflict. Commentary in the Arab press also reflects a similar view. Fayez Al-Fayez, a political analyst and a columnist with Ammon News, for example, argued that any UN resolution that limits Iranian intervention will mark the beginning of the end to the conflict. “It is very important to mobilize international efforts to intercept and end Iranian expansionist projects in Yemen, Syria, and elsewhere,” he recently wrote. The battle to recapture Hodeidah began earlier in June but reached a stalemate until the failure of recent peace talks in Geneva. The port city is of strategic importance for various reasons: it serves as the main entry point for food and medical aid to millions of Yemeni civilians; it is a pipeline for smuggling Houthi weapons into Yemen; and it is also a source of customs revenues for Houthis to finance their political and military activities. The rebels still control the Hodeidah city.